"This is quite simply an excellent book! Bizarrely, this statement in itself fails to do it justice, as this is considerably more than just a book. The DVD tucked in the back cover allows the reader to explore in greater depth case studies, gives access to countless images, tests your understanding of the main topics and provides hotlinks to relevant websites...I have no hesitation in recommending it." Value-packaged for Students - One price includes the Textbook AND Interactive DVD! Essential Plant Pathology, Second Edition is packaged with a DVD that includes extras for students and professors alike. The first edition of this best selling textbook was carefully reviewed by subject matter specialists and plant pathology course instructors to help update the content, especially some of the quickly changing molecular aspects of host-parasite interactions. This edition includes an important section to teach students about gene silencing using RNA interference. The authors did not stray from their highly successful original approach. Imagine a plant pathology textbook that introduces and teaches all the key concepts of the science and is readable in a single semester by each and every student in your class. Essential Plant Pathology achieves that goal because it was written with students in mind. This inviting edition is written specifically to the introductory plant pathology course level by award-winning educators, Gail Schumann and Cleo D’Arcy. The book is reader-friendly with important terms and concepts clearly identified. Special “Did you know?” boxes will spark student interest by providing cultural and historical facts about plant diseases and every chapter will guide students to recommended resources, study questions, “Words to Know,” Internet research exercises, and DVD exercises. The second edition text comes packaged with a dynamic DVD that works hand-in-hand with the popular APSnet Education Center and provides students and their professors with an engaging way to learn and teach plant pathology. This DVD contains many important supplementary materials that can be used without internet access, including: expanded and revised identification exercises, APSnet Education Center peer-reviewed instructional materials, and web links for each chapter. The DVD is a key part of the book because it includes links to all of the enrichment materials from the APSnet Education Center, APSnet feature articles, and links to recommended websites. These are used for the exercises at the end of each chapter. This allows students to learn about diseases and topics of specific interest to them. Also, there are identification exercises for most of the chapters on the DVD. The DVD also includes the illustrated glossary with photos, diagrams and many of the definitions which are not included in the printed version in the book. For instructors, there are high resolution versions of all of the text images. A printed version of the glossary on the DVD has been added to the textbook which includes synonyms, antonyms, and related terms that will aid students in learning the plant pathology vocabulary. 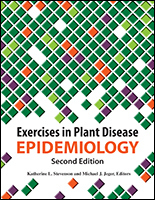 In addition, Appendix 2, which provides disease examples, has been revised to add more tropical crops and diseases for use in chapter exercises. Its easy-to-read, open-page design has illustrations and boxed call-outs emphasizing critical concepts. “In This Chapter” presents key concepts the students will learn. “Disease Classics” provide short boxed summaries of important diseases typically studied in introductory plant pathology courses. “Did you know?” call-outs present cultural and historical facts about plant diseases to help students understand how plant pathology impacts the real world. “Case Studies” help students understand the specific causes, symptoms, and cycles of important diseases. Each chapter includes “Study Questions” to help students check their comprehension and “Recommended Resources” to challenge them to learn more. “Words to Know” at the end of each chapter will improve your student’s plant pathology vocabulary. Students will find these words defined in the Illustrated Glossary included in the companion DVD that comes packaged with their book. A printed version of the glossary on the DVD has been added to the textbook which includes synonyms, antonyms, and related terms. Icons in the book identify direct links to specific DVD and Internet exercises appealing to today’s digitally oriented student. These exercises allow instructors to custom design virtual labs to complement their lectures. Full integration between the textbook, DVD, and the APS peer-reviewed Education Center, the most popular area of APSnet. This is today’s student’s Internet connection for key feature articles on hot topics written by practicing plant pathologists. Instructors, you will appreciate how the DVD helps with course prep. It allows you to easily tie your lectures to the textbook to emphasize key concepts. Every image and illustration in the book is included on the DVD and ready to be imported into PowerPoint™ lectures. It’s easy to copy and paste diagrams and color photos into presentations and reinforce your lectures with corresponding illustrations in the book. The students can use the illustrations on the DVD too. 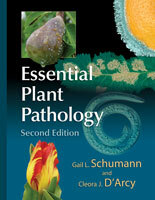 Plant Pathology educators may review Essential Plant Pathology, Second Edition for consideration as a course textbook. Customers inside the U.S. - Examine the book and companion DVD free for 60 days with no obligation to purchase. You will receive the book along with an invoice. If you choose to keep the book, but not adopt it for your class, simply pay the invoice. If you choose to adopt the book for your class, keep the book with compliments of APS PRESS when you write “Complimentary Desk Copy” on your invoice and return it with a photocopy of your bookstore order or bookstore requisition form for 10 or more copies of the textbook. If you decide not to adopt the book for your class and you do not wish to keep the book for your personal use, simply return the book and DVD in resalable condition with a copy of your invoice and write cancel on the invoice. Customers outside the U.S. – Request an exam copy of the book and companion DVD for 60 days. You will initially pay for the book and if you choose to adopt the book for class, e-mail or mail a photocopy of your bookstore order or bookstore requisition form for 10 or more copies of the textbook and APS PRESS will issue a full refund for the book. If you decide not to adopt the book for your class and you do not wish to keep the book for your personal use, simply return the book and DVD in resalable condition with a copy of your invoice within 60-days of the order date and write cancel on the invoice. You will receive a full refund. University and College Bookstores qualify for a 20% off the "Regular Price" when ordering Essential Plant Pathology, Second Edition. Return Policy: Overstocks must be returned within 6 months of invoice date. A 15% or minimum of $10 restocking fee will be deducted from the credit due. To place an order please contact APS PRESS Customer Care. Call 1.800.328.7560 U.S. and Canada (+1.651.454.7250 elsewhere) or send an e-mail to aps@scisoc.org. Please provide the name and number of the course you are ordering for and the name of the professor teaching the course. Bookstores cannot order online. Bookstores need to contact APS PRESS Customer Care to place their order and will receive 20% off the regular price of Essential Plant Pathology, Second Edition. CHAPTER 1: What Is Wrong with My Plant? How do we diagnose plant diseases? What is the plant disease triangle? How do we know what organism causes a disease? What are biotrophs and necrotrophs? What are disease cycles and how can we use them? CHAPTER 2: What Are the Causes of Plant Diseases? What symptoms and signs do fungi cause? How do fungi survive and spread? How are fungal diseases diagnosed? How are fungal diseases managed? CHAPTER 3: What Are the Causes of Plant Diseases? What symptoms and signs do bacteria cause? How do bacteria survive and spread? How are bacterial diseases diagnosed? How are bacterial diseases managed? CHAPTER 4: What Are the Causes of Plant Diseases? What symptoms and signs do nematodes cause? How do nematodes survive and spread? How are nematode diseases diagnosed? How are nematode diseases managed? CHAPTER 5: What Are the Causes of Plant Diseases? What symptoms and signs do viruses cause? How do viruses survive and spread? How are virus diseases diagnosed? How are virus diseases managed? CHAPTER 6: What Are the Causes of Plant Diseases? What are parasitic flowering plants? What symptoms and signs do parasitic flowering plants cause? How do parasitic flowering plants survive and spread? How are diseases caused by parasitic flowering plants diagnosed? How are parasitic flowering plants managed? CHAPTER 7: What Are the Causes of Plant Diseases? What symptoms do abiotic factors cause? How are abiotic diseases diagnosed? How are abiotic diseases managed? CHAPTER 8: What Types of Plant Diseases Are There? What diseases commonly affect foliage, flowers, and fruit? CHAPTER 9: How Do Plants Interact with Pathogens? How do pathogens survive in the absence of host plants? How do pathogens find plants? How do pathogens penetrate plants? How do pathogens establish infections? What are the genetic interactions between plants and pathogens? How can we create disease-resistant plants? CHAPTER 10: How Do People Influence Plant Disease Epidemics? Can we predict plant diseases? How do people affect the susceptibility of plants to disease? How do people affect the environment of plants in ways that increase disease? How do people affect the ability of pathogens to cause disease? How do plant disease epidemics affect people? CHAPTER 11: How Can We Prevent or Manage Plant Disease Epidemics? How do we choose the appropriate methods for disease management? How do we avoid pathogens? How do we exclude pathogens? How do we eradicate pathogens? How do we protect plants? How can we create integrated, sustainable management programs? Which to use: Immunoassay, PCR, or standard microscopic examination and culturing? "This introduction textbook for education of students is a very remarkable one. It gives an introduction not only as the title shows into essential parts of the Plant Pathology but by the present second edition with the added incorporated DVD an excellent material to learn and to teach all scientific and practical fundamentals of the named area. A particularity of this textbook is the style of writing and the kind of demonstration all elements, which induce a real motivation to study and help to understand the special matter, instead only to read about. Headings of each main- and sub-chapter are formulated as question and so it comes out always a kind of looking for the text as answer. Corresponding the text general is written precisely with concentrated summaries to determine important points. On pages of each chapter the text is arranged in an inner column, escorted by an outer one containing illustrations, images, summary boxes, and short summaries of important diseases for type studies. A second quality mark of the textbook is the excellent illustration of described organisms, things and facts, phenomena and processes in frame of the plant pathology, by photographs, drawings and diagrams. This does increase the understandability of the matter remarkably. Last not least the great value of the publication is substantiated by the added, incorporated new DVD. Combined with the text it gives further detailed illustrations, guidelines for lab exercises, special topics, disease classic lists, example diseases, rapid essays for pathogens and above all an opening to web resources, related literature, instructions for teachers and instructors. Therefore, this textbook is bound internationally. So the present excellent textbook can be highly recommended for students, who are starting to study the Phytomedicine for later graduation. They and their instructors get an optimal help for an introduction and a motivation for further detailed studies of this discipline. Secondly, the style of writing, the structure of the book and the kind of material presentations give a guarantee for high quality and effective learning and teaching and so the complete textbook can be emphasized too as interesting example for future authors of related publications." "Mycologists, plant pathologists, and serious home gardeners take note: the second edition of Essential Plant Pathology has just been published and is now available. You cannot imagine how useful this book is. 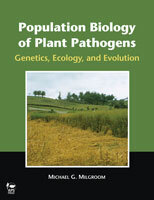 Or how much more user-friendly this book is over what is currently the standard in introductory plant-pathology texts. Like most plant-pathology students of my day and before, we grew up with Agrios's book. It was the gold standard. But in so many ways, I think Schumann and D'Arcy's new book is better especially for beginning students, amateur mycologists, and home gardeners. Although quite a few plant pathogens are bacterial, viral, nematode, or of other origins, the vast majority are fungal in nature, and with very interesting life cycles. Unfortunately, mycological texts cover few of these in detail and field guides barely mention any plant pathogens at all. Essential Plant Pathology will nicely fill a long overdue void on your bookshelf. Many of the early chapters have, as a theme, "What Are the Causes of Plant Diseases?" and discuss a particular group (e.g. Fungi, Bacteria, Parasitic Plants, etc.). Essential Plant Pathology is beautifully laid out with full color on every page and is heavily illustrated (290 images!). As if that weren't enough, the book accompanied with a DVD filled with more than 400 high resolution color images and line drawings. Besides the usefulness of examining them in detail on your computer, the images can be quickly dropped into text files or a digital slide presentation In fact, the DVD works with the popular APSnet Education Center and provides an engaging way to learn (and teach) plant pathology. Important terms and concepts are very clearly explained. Special "Did you know?" boxes will spark interest by providing cultural and historical facts about plant diseases; and every chapter guides the reader to recommended resources, study questions, "Words to Know," internet research exercises, and DVD exercises. Probably my favorite aspect of each chapter are callout boxes featuring "Disease Classics" that provide short summaries of important diseases (most of them fungal in nature) typically studied in introductory plant pathology courses. Many of these plant pathogens have altered the course of mankind, e.g. coffee rust, which turned the British from coffee fanatics to tea drinkers, and late blight disease of potatoes, which caused wide spread famine in Ireland and throughout Europe. Essential Plant Pathology is quite up to date, as well, examining recently discovered diseases like citrus canker, sudden oak death, and soybean rust. Likewise, the latest techniques for disease diagnosis and pathogen detection (ELISA, PCR, DNA sequencing, computerized environmental monitoring equipment, etc.) in modern laboratories are discussed in very easy to understand terms. 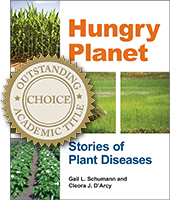 Award-winning educators and plant pathologists Gail L.Schumann and Cleora D'Arcy are superbly suited to write an introductory level text on the topic. Schumann received her M.S. and Ph.D. in Plant Pathology from Cornell University and is Professor Emerita at the University of Massachusetts-Amherst, where she taught several plant pathology courses and was a well-known researcher in turfgrass pathology. She is the author of textbooks and more than 50 peer-reviewed publications on teaching and turfgrass pathology. The U. S. Department of Agriculture and American Phytopathological Society, among others, have awarded her for her excellence in teaching. Cleora J. D'Arcy received her M.S. and Ph.D. in Plant Pathology from the University of Wisconsin-Madison; she is Professor Emerita in the Department of Crop Sciences at the University of Illinois at Urbana-Champaign. D'Arcy teaches undergraduate and graduate courses on plant pathology and professionalism and ethics, and researches virus diseases of plants. Besides books on plant pathology, she has written over 75 peer-reviewed publications on plant virology and teaching. She is a past president of the American Phytopathological Society and has been honored by the U.S. Department of Agriculture and American Phytopathological Society, among others, for her excellence in teaching." “This is quite simply an excellent book! Bizarrely, this statement in itself fails to do it justice, as this is considerably more than just a book. The CD-ROM tucked in the back cover allows the reader to explore in greater depth case studies, gives access to countless images, tests your understanding of the main topics and provides hotlinks to relevant websites...I have no hesitation in recommending it."